Holding a dumbbell in each hand, bend at the hips and knees until your torso is parallel to the floor. Your back should be straight and your arms should be hanging in front of you, with your palms facing inwards (neutral grip). Keeping your elbows slightly bent, raise both arms out to the sides until the dumbbells are level with the height of your shoulders. Don’t forget to exhale. Inhale as you lower the dumbbells to the starting position in a controlled manner. Do not swing the dumbbells upward. Try to resist the lowering of the dumbbells. Keep your back straight and your body still. You will not target your posterior deltoids unless your torso is horizontal. Keep your upper arms perpendicular to your torso to minimize the involvement of your lats. 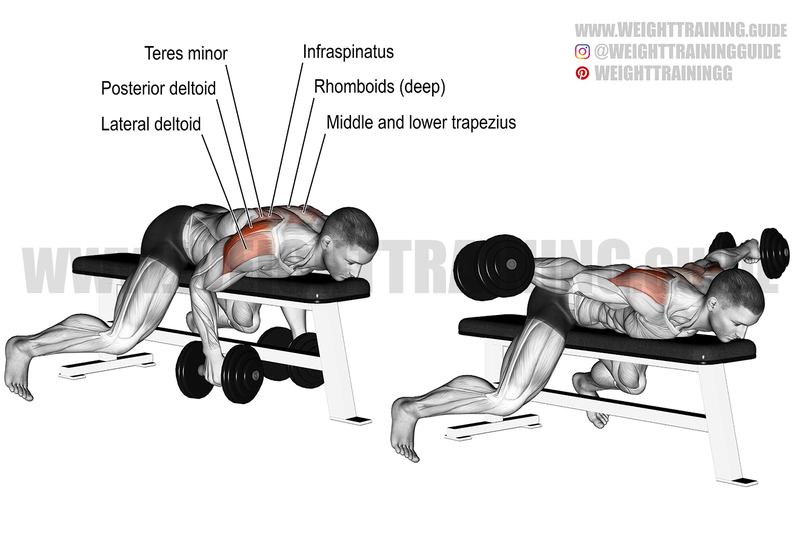 The dumbbell bent-over lateral raise is also known as the dumbbell rear lateral raise. Also see the seated bent-over lateral raise and the head-supported bent-over dumbbell lateral raise. Oh my goodness! Amazing site dude!